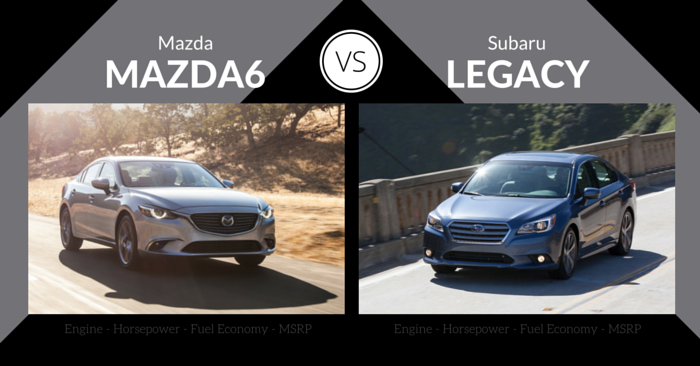 The mid-size sedan segment has long been heavily contested. If you’re looking for an efficient vehicle with room to haul a few friends or a small family, Nissan and Honda have two attractive choices. 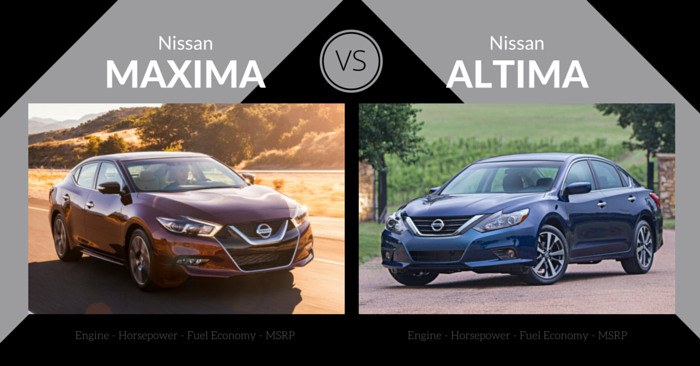 Today, Carsforsale.com is comparing specs, design, performance, safety, and features of the the Nissan Altima vs Honda Accord to help you decide which vehicle will best fit your needs. The 2016 Honda Accord is currently available, but the 2016 Nissan Altima won’t be available until late November. The exterior of the 2015 Nissan Altima features many soft, flowing lines. It’s both a conservative and handsome presentation that resembles the Altima’s Infiniti cousins. The front features the classic half hourglass Nissan grille with large headlamps. Side and rear design maintains the theme of smooth lines, while sharp tail lights add some design contrast. Step inside the 2015 Altima, and you’ll find design and quality that is near the top of its class. Interior noise is extremely low. The look is simple, but everything feels upscale. Buttons and gauges are arranged symmetrically and simply. The shift knob is set to the left, while cup holders are set toward the passenger. Space is great for 4 adults with great leg room and head room, but fitting 5 adults could be tight. 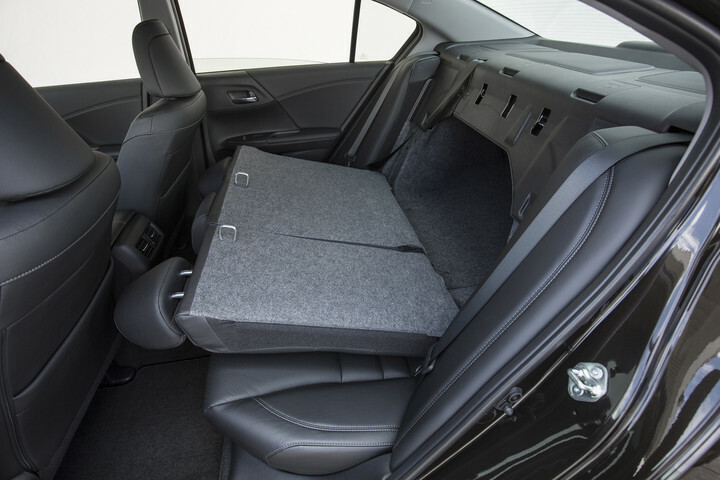 Trunk space is slightly above average, and 60/40 rear folding seats create additional storage space. Drivers are able to choose between 2.4L 4-cylinder that produces 182 hp, and a 3.5L V-6 engine that produces 270 hp. 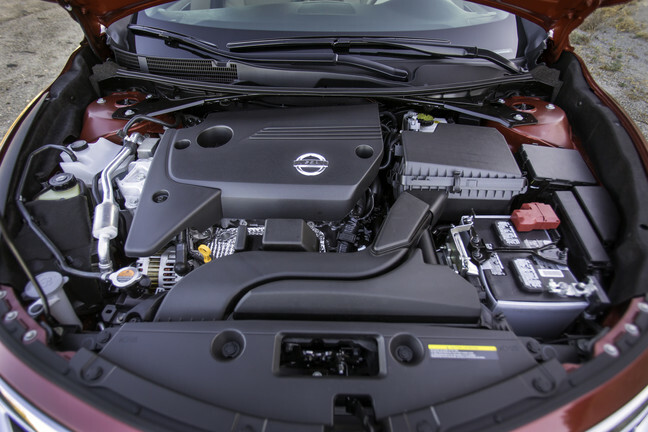 The 2015 Nissan Altima makes the most of the base engine, thanks to a responsive CVT. It’s a surprisingly sporty small engine in a class of mundane performance. Those wanting a little more will appreciate the V6 that is much more powerful, and produces a more satisfying engine sound. 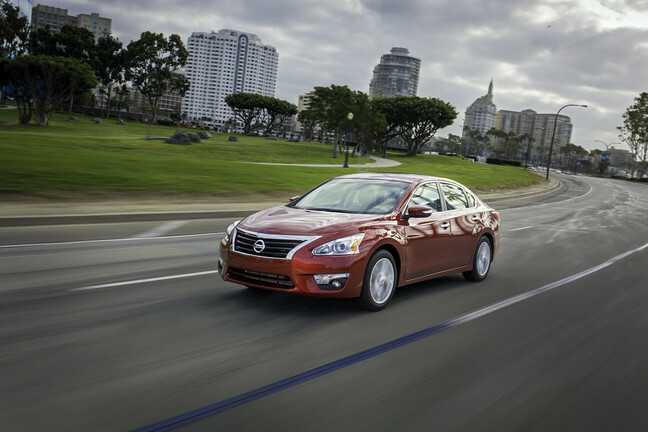 Nissan has achieved exemplary efficiency in the Altima, with 27 mpg city and 38 mpg highway in the base model. The V-6 is less efficient, achieving 22 mpg city and 32 mpg highway. The 2015 Nissan Altima earned 5 stars from the NHTSA and is a NHTSA Top Safety Pick. 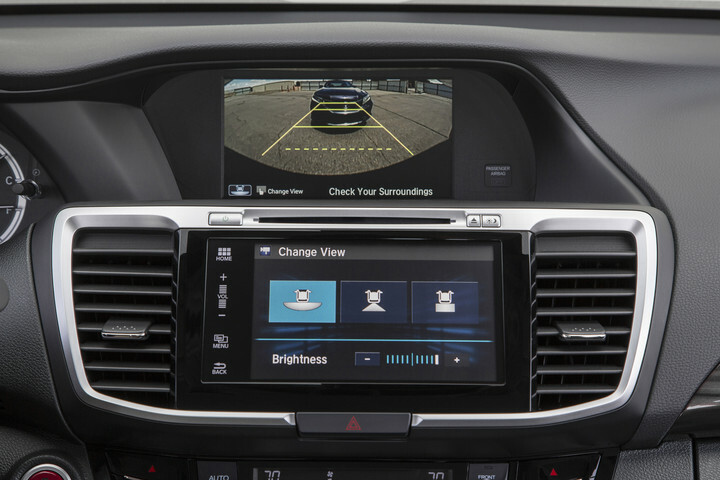 Available safety features include rearview camera, lane-departure warnings, auto-dimming rearview mirror, blind-spot monitors, and more. The only feature lacking is a form of forward collision prevention. Every 2015 Altima comes with expected features, plus a few perks such as push-button start, Bluetooth with streaming audio, and Nissan Intelligent Key. Other features include 7-inch touch screen and navigation, steering-wheel audio controls, moonroof, paddle shifters, USB, infotainment, and more. 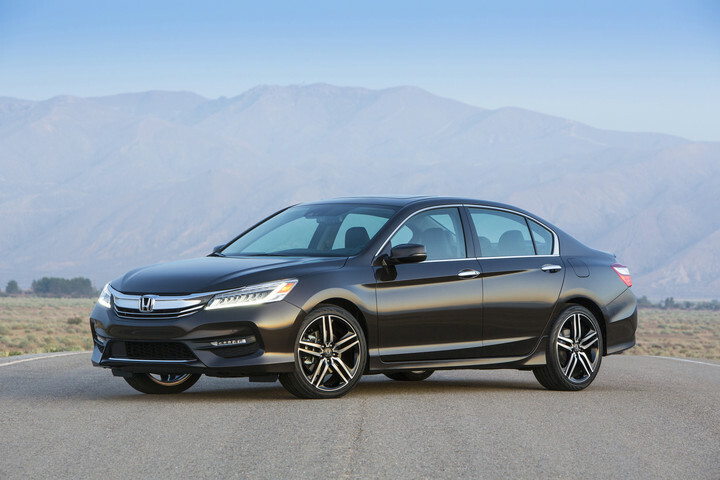 The 2016 Honda Accord has a few stylish exterior updates that make it stand out from the crowd. LED fog lights are new on sport trims and above, while LED taillights have been redesigned as well. The 2016 Accord has a muscular aluminum hood, a fresh Honda grille, and elegant LED headlamps. Step inside the latest Accord and you’ll find design that is both modern and luxurious. The low instrument panel is pushed far forward, maximizing space. The center stack is layered, creating clear and dynamic separation between buttons and the touch screen. Material quality is top-notch for the class. With Active Noise Control and Active Sound Control, the 2016 Accord has a very quiet ride. Adults will have no trouble fitting in the 2016 Honda Accord. Seating is comfortable, and storage space is adequate. The trunk is great for the class, and storage space can be expanded thanks to 60/40 split folding seats. The base engine in the Honda Accord is a direct-injected 2.4L 4-cylinder producing 185 hp. This engine performs well for a small, efficient engine, and will produce adequate power for most drivers. Those wanting better performance can choose Honda’s well-refined 278 hp V-6 engine. 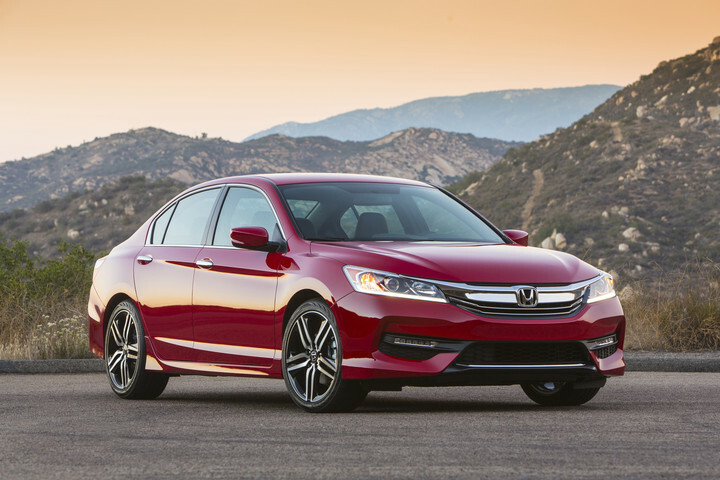 In 2016, the Accord achieves 27 mpg city and 37 mpg highway in the base engine. The powerful V-6 achieves 21 mpg city and 34 mpg highway. The NHTSA gave the 2016 Accord 5 stars overall, and the IIHS called the Accord a Top Safety Pick +. This sedan can be equipped with Honda Sensing, a suite of safety features that includes collision mitigation braking, lane keeping assist, adaptive cruise control, blind spot monitors, and a blind spot camera. A rearview camera comes standard. Every 2016 Honda Accord is equipped with dual-zone automatic climate control, 8 inch display screen, Bluetooth, multi-angle rearview camera, and more. Upgrades include paddle shifters, dual exhaust, rear spoiler, Apple CarPlay, Android Auto, push-button entry, heated mirrors, leather seating, and more. With standard perks like rear-view camera, 8-inch display screen, and dual-zone automatic climate control, it’s hard not to like the Accord. 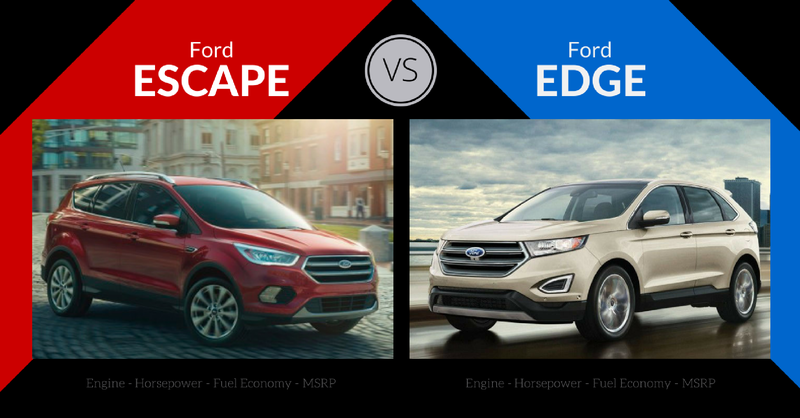 The base engine doesn’t leave you wanting more like some efficient 4-cylinder engines. 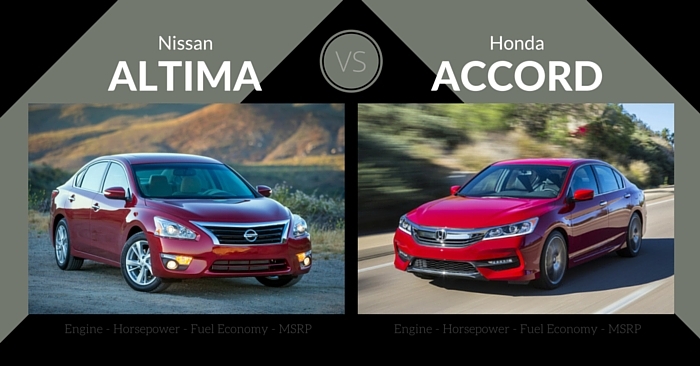 When comparing the Nissan Altima vs Honda Accord, the Honda Accord takes the crown thanks to incredible looks, luxurious interior, and top-of-class performance. If this vehicle holds true to Honda’s reputation of reliability, this is arguably the best buy in the mid-size sedan class. If you’re a die-hard Nissan fan, the Altima is still a quality vehicle. While the 2015 Altima falls short of the 2016 Accord, the 2016 Altima arrives in late November, and we are eager to see if Nissan can catch up to or pull ahead of Honda in the mid-size sedan class. Which vehicle would you rather own? Let us know in the comments below!